Yet another useless Internet quiz that tries to match your personality with something more identifiable. 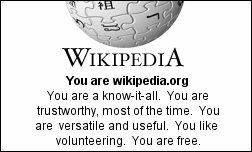 Wikipedia? No wonder people kept on bugging me as though I was yellow pages. So it stands for Synthetic Cybernetic Organism Trained for Troubleshooting in the cyborg language. Or in layman's term it sounds like helpdesk monkey kind of job description, which is very true sometimes. I am taking the quiz which everyone else seems to be taking. Which book of the Bible are you? You are Revelation. How it works out the result still puzzles me.